21. The Jewish Agency for Israel rents three rooms in a non-descript small house in the center of Mykolaiv. The neighborhood in which JAFI is based is the pre-war Jewish district of the city, said Irina Kozlova, the local JAFI coordinator. The Mykolaiv office covers three additional cities, the largest of which is Kherson, located some 60 kilometers (approximately 37 miles) to the southeast. Whereas more than 5,000 Jews live in Mykolaiv, the Jewish population of Kherson probably is between 3,000 and 5,000, said Ms. Kozlova. However, she continued, the smaller Kherson Jewish population is more difficult to reach because it is dispersed in small settlements in agricultural regions. The settlements are a legacy of Agro-Joint. 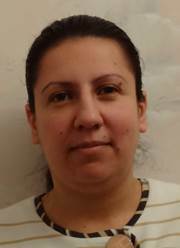 Irinia Kozlova, a local woman, is a Jewish Agency coordinator in the Mykolayiv region of southern Ukraine. Ms. Kozlova stated that many local Jews are unaware of their Jewish heritage; others, she continued, may be aware of Jewish ancestry, but are afraid to identify openly as Jews and participate in Jewish programming. Only a minority of Jewish youngsters attend Jewish day schools, she continued. Many are ineligible for day school admission because the schools require that pupils be halachically Jewish, that is, that their mothers be halachically Jewish. Others find the atmosphere of such schools too religious. Neighborhood schools are more convenient and require no fees. Local conditions are difficult, said Ms. Koslova, and this situation builds aliyah. Perhaps the primary issue cited by those Jews who wish to go to Israel is the low quality of local higher education. Many people lack confidence in it and are attracted by educational opportunities in Israel, particularly the Na'aleh high school in Israel program and the year-long Selah course that prepares young people for entry into Israeli institutions of higher education. Aliyah to Israel is increasing, Ms. Kozlova stated; 54 people went to Israel from Mykolayiv in 2012, and 38 went to Israel from Kherson. Overwhelmingly, the migrants are young families and youth. Most adults are well-educated, she continued. JAFI operates a number of programs within its three-room premises to acquaint local Jews with Jewish culture and with Israel. A Sunday school meets every Sunday for youngsters between the ages of six and 12. Limudiot is for youngsters aged 11 to 14. The primary goal of Limudiot is preparation of participants for examinations required for acceptance into the Na'aleh high school in Israel program; because local schools are weak, youngsters are tutored in mathematics and English. They also are instructed in Jewish tradition and are assessed for psychological readiness for Naaleh, that is, for readiness to leave home and family and to live in a group setting while attending high school in Israel. Taglit (birthright Israel) remains very popular; eight young people participated in the recent Taglit winter trip, and 11 have been accepted for the summer trip. Ten young people from the region are enrolled in 2012-2013 MASA programs, she said. JAFI promotes these education programs by participating in a city-sponsored three-day education exhibit designed to inform young people and their families about educational opportunities in Mykolaiv and elsewhere in Ukraine. It is expensive for JAFI to rent space in this exhibit, averred Ms. Kozlov, but it is very worthwhile because all high schools in the area send their upper classes to the event and many families attend independently. Some people openly acknowledge their Jewish identity for the first time when they visit the JAFI display that showcases various educational programs in Israel. Three Hebrew-language ulpans operate in Mykolaiv, said Ms. Kozlov, and a fourth meets in the Chabad synagogue in Kherson. Two Hebrew teachers instruct all of these classes. Mykolaiv and Kherson youngsters attend the same JAFI summer camp that Odesa youngsters attend, said Ms. Kozlov in response to a question. 22. The American Jewish Joint Distribution Committee maintains a small three-story building in Mykolayiv that accommodates a hesed and a Jewish community center. The hesed and a Jewish museum, along with various offices, are located on the ground floor of the building, and the community center occupies the second and third floors. 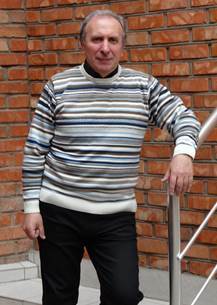 The writer spoke with Mikhail Goldenberg, who is the local JDC representative. Mr. Goldenberg stated that the hesed assists 1,800 clients. About 250 housebound elderly receive various services in their homes, and another 100 elderly Jews participate in day center activities in groups of 20 at the building. The day center program provides light refreshments, but no longer serves full meals to its clients. However, said Mr. Goldenberg, some participants bring food to the center for their day center groups, especially on their birthdays. Clients may purchase JDC discount cards for use at local supermarkets and pharmacies, he said. In addition to programs for Jewish elderly, Mr. Golden-berg continued, about 200 at-risk children receive material assistance, and about 80 youngsters from very poor families or who have disabilities of various types receive therapeutic services at the hesed. Mikhail Goldenberg, right, directs the hesed and Jewish community center in Mykolaiv. About 600 local Jews use the Jewish community center, stated Mr. Goldenberg. JCC premises include a community library, class room, art studios, a fitness studio, and a multi-purpose room/theater. Children come after school and families use the facility on weekends. The Center also supports research on the history of Jews in Mykolaiv; after extensive archival research, several books have been published on this topic. Additionally, said Mr. Goldberg, the JCC sponsors a family camp that attracts about 120 local Jews every year. 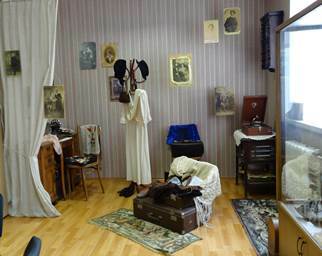 A one-room museum on the ground floor of the Mykolaiv JCC includes documentation regarding history of the local Jewish population, including the Holocaust. One corner of the room attempts to depict a pre-war Jewish home, using furniture and other artifacts preserved from that period. Founded in 1778 on the banks of the Dnipr River, Dnipropetrovsk was known until 1926 as Ekaterinoslav, in honor of Catherine II (Catherine the Great) whose troops conquered the territory. As the Soviet Union consolidated its power in the 1920’s, place names associated with the tsarist period were changed to reflect Communist control. Currently the third largest city in Ukraine, following Kyiv and Kharkiv, the population of Dnipropetrovsk is slightly over one million. It was a closed city until mid-1990 due to its extensive military industry, particularly Yuzhmash, a producer of intercontinental ballistic missiles, booster rockets, and related products. Dnipropetrovsk continues to be a center of heavy industry, hosting factories producing cast iron, rolled metal, pipes, mining and agricultural machinery, large appliances, and transportation equipment. Other prominent industries in the city include food processing and apparel manufacture, the latter for European firms. Notwithstanding the current economic crisis that affects the local economy, just as it affects the remainder of the country, Dnipropetrovsk remains a relatively wealthy city in Ukraine. The oblast government is considered among the most enlightened and capable in the country; private enterprise is encouraged and supported, thus diversifying the economy and providing some hedge in conditions of economic turbulence. Historically, the city has been an important source of leadership for the former Soviet Union and for post-Soviet Ukraine. Soviet leader Leonid Brezhnev, former Ukrainian Prime Minister Valery Pustovoitenko, and former Ukrainian President Leonid Kuchma all spent significant portions of their careers in important leadership positions in the city. Yulia Tymoshenko, the immediate past Prime Minister of Ukraine now imprisoned by the current President of Ukraine, is a native of Dnipropetrovsk. Photo: https://en.wikipedia.org/wiki/File:Dnipropetrovsk_Panorama.jpg. Retrieved July 19, 2013.